Ethan Slater (born June 2, 1992) is an American actor, singer, writer, and composer best known for his role as SpongeBob SquarePants in the musical of the same name, for which he received a Tony Award nomination for the Best Performance by a Leading Actor in a Musical category. Slater grew up in Silver Spring, Maryland, with two older sisters, Sara Slater and Tamara Slater. His mother died when he was 7. His father, Jay Slater, is remarried, and Slater has two step-brothers. His family is Jewish. He attended Charles E. Smith Jewish Day School and Georgetown Day School. He attended Vassar College in Poughkeepsie, New York. In 2012, Slater began dating his former high school classmate Lilly Jay. In 2018, the two were married. Officer Reynolds Episode: "Thanksgiving and Taking"
^ Haun, Harry (December 25, 2017). "Ethan Slater on How He Prepares Each Night to Be 'SpongeBob' on Broadway". Observer. Retrieved January 21, 2018. ^ Schleier, Curt (December 24, 2017). "The happy-go-lucky 25-year-old Jewish guy who plays SpongeBob on Broadway". The Times of Israel. Retrieved May 7, 2018. ^ Jackson, Dory (April 16, 2018). "Ethan Slater Talks About Playing SpongeBob SquarePants on Broadway". Newsweek. Retrieved May 7, 2018. ^ Tietjen, Alexa (December 22, 2017). "Ethan Slater Is SpongeBob SquarePants". Women's Wear Daily. Retrieved May 7, 2018. ^ a b Deb, Sopan (November 22, 2017). "He Knows Bikini Bottom. Now He Gets to Swim There". The New York Times. Retrieved December 2, 2018. ^ Engel, Margaret (April 2, 2018). "Showstopper". Bethesda Magazine. Retrieved December 2, 2018. ^ Slater, Ethan (November 22, 2018). "feeling thankful. . . . . #tbt #nationalpark #married #notinthispictho". Instagram. Retrieved December 2, 2018. ^ Lefkowitz, Andy (November 19, 2018). "Norbert Leo Butz, Laura Osnes, Ethan Slater, Kelli Barrett & More Join FX Series Fosse/Verdon". Broadway.com. Retrieved December 2, 2018. 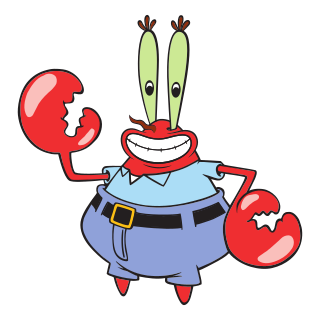 Eugene H. Krabs, is a fictional character in the American animated television series SpongeBob SquarePants. He is voiced by actor Clancy Brown and first appeared in the series' pilot episode "Help Wanted" on May 1, 1999. The character was created and designed by marine biologist and animator Stephen Hillenburg. Pearl Krabs is a fictional character in the American animated television series SpongeBob SquarePants. She is voiced by actress Lori Alan and first appeared in the season one episode "Squeaky Boots" on September 4, 1999. She was created by marine biologist and animator Stephen Hillenburg, who was inspired to design a whale character while supervising whale watches at the Ocean Institute in Dana Point, California. William Mark Fagerbakke is an American actor and voice actor. He is best known for his long-running roles as Patrick Star in the animated series SpongeBob SquarePants and Michael "Dauber" Dybinski on the sitcom Coach. He also appeared in 12 episodes of the sitcom How I Met Your Mother as Marshall Eriksen's father Marvin. Stephen McDannell Hillenburg was an American animator, voice actor, and marine biologist. He was best known as the creator of the Nickelodeon animated television series SpongeBob SquarePants (1999–), which he also directed, produced, and wrote. It has gone on to become the fifth longest-running American animated series. "What Ever Happened to SpongeBob? ", promotionally known as "WhoBob WhatPants? ", is the 18th episode of the fifth season and the 98th overall episode of the American animated television series SpongeBob SquarePants. It originally aired on Nickelodeon in the United States on October 13, 2008. The SpongeBob Movie: Sponge Out of Water is a 2015 American 3D live-action/animated absurdist Superhero comedy film based on the animated television series SpongeBob SquarePants. A stand-alone sequel to The SpongeBob SquarePants Movie (2004), it was directed by former series showrunner Paul Tibbitt in his directorial debut, with live-action sequences directed by Mike Mitchell. It was the first film to be produced by Paramount Animation and the second film in the SpongeBob SquarePants film series. The film stars Antonio Banderas and features the show's regular voice cast, who returned to reprise their respective roles from the series and the previous film. This movie takes place during the ninth season of SpongeBob SquarePants. The plot follows a pirate named Burger Beard, who steals the Krabby Patty secret formula using a magical book that makes any text written upon it come true. SpongeBob and his friends must travel to the surface to confront Burger Beard and get the formula back. In addition to the show's regular cast of voice actors, guest stars have been featured on SpongeBob SquarePants, an American animated television series created by marine biologist and animator Stephen Hillenburg for Nickelodeon. SpongeBob SquarePants chronicles the adventures and endeavors of the title character and his various friends in the fictional underwater city of Bikini Bottom. Many of the ideas for the show originated in an unpublished, educational comic book titled The Intertidal Zone, which Hillenburg created in the mid-1980s. 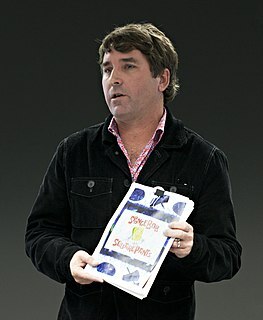 He began developing SpongeBob SquarePants into a television series in 1996 upon the cancellation of Rocko's Modern Life, which Hillenburg directed. The pilot episode first aired on Nickelodeon in the United States on May 1, 1999. The show's eleventh season premiered in 2017, and 244 episodes of SpongeBob SquarePants have aired. A series of feature-length theatrical films based on the show began in 2004 with The SpongeBob SquarePants Movie, followed by a 2015 sequel and a third installment set for 2020. SpongeBob SquarePants is an American animated television series created by marine biologist and animator Stephen Hillenburg that debuted on Nickelodeon in the United States on May 1, 1999. The regular voice cast consists of Tom Kenny, Bill Fagerbakke, Rodger Bumpass, Clancy Brown, Doug Lawrence, Jill Talley, Carolyn Lawrence, Mary Jo Catlett and Lori Alan. Most one-off and background characters are voiced by Dee Bradley Baker, Sirena Irwin, Bob Joles, Mark Fite and Thomas F. Wilson. Throughout the show's run, it has employed numerous guest stars from many ranges of professions. Repeat guests include Ernest Borgnine, Tim Conway, Brian Doyle-Murray, Marion Ross, John O'Hurley and Michael McKean. SpongeBob SquarePants: The Broadway Musical is a stage musical, co-conceived and directed by Tina Landau with songs by various artists and a book by Kyle Jarrow. It is based on the Nickelodeon animated television series SpongeBob SquarePants and made its world premiere in June 2016 at the Oriental Theatre in Chicago. The musical premiered on Broadway at the Palace Theatre in December 2017. SpongeBob SquarePants is an American animated/live-action comedy film series based on the Nickelodeon television program of the same name, created by Stephen Hillenburg. It began in 2004 with the release of The SpongeBob SquarePants Movie. The series is distributed and owned by Paramount Pictures, a subsidiary of Nickelodeon's parent company Viacom. All films feature the regular television voice cast: Tom Kenny, Bill Fagerbakke, Rodger Bumpass, Clancy Brown, Mr. Lawrence, Jill Talley, Carolyn Lawrence, Mary Jo Catlett and Lori Alan. The first installment is directed by Hillenburg, the second is directed by former showrunner Paul Tibbitt, and the third is directed by former writer Tim Hill.